Rubblebucket is one of the most compelling contemporary bands to see live. 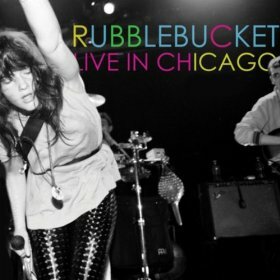 Their latest release, a DVD/CD, Live in Chicago, displays all the brilliant lights and sounds that an audience can expect while attending one of their shows. The raw beauty of tight synchronized horns and Kalmia Traver’s vivid alto vocals shine on the album. The epic Rubblebucket songwriting is accentuated by psychedelic jams that you just won’t hear on a studio album. The often synchronized, usually adorable, mostly quirky, and sometimes erratic dance moves displayed by trombonist Adam Dotson and trumpeter Alex Toth, are emblematic of the intentional energy that Rubblebucket pours over their audiences. Live in Chicago was filmed at the Double Door in Chicago by Audiotree Live in October 2011.